There are many, many things to have expectations for/about in life, but this post is focusing on self-expectations, specifically in regards to goals/resolutions, because these are the expectations we have the most control over. I set some goals for myself at the beginning of the year and by the second week of February I knew I’d built a pretty high mountain to climb. January went well. Book read, edits done, writing mark hit! Of course I also finished a book, so starting a new one was hard–immediately my word count plummeted. I finished edits, got beta reads, submitted the book…and immediately got developmental edits to do. While I was brainstorming how to fix February’s editing case. So my “edit a book a month” plummeted. Reading one book should be easy, right? But after reading all day, editing various books, and struggling to write, the last thing I wanted was another person’s words in my head. I read one page of a book and switched to another. Read a page of that and put it aside. What I realized around the middle of the month, was that I might have burnt myself out by being too productive too fast. I need to reassess and adjust accordingly. Revising: One book a month is kind of crazy, especially depending on how much work needs done. Especially since I edit for a living (duh, Alex). I think if get 6 books revised this year, I’ll call it a win. It’s still going to be about 5 more books than I did last year! Writing: Same basic 10K a month, but I think it’ll be a year-end goal of 120,000 instead, which will average out to 10K a month, which is pretty much how I looked back a 2017, so I think it’ll work. The important thing, for me, is not thinking of the above changes as failing. Goals and resolutions should be flexible, especially in the beginning, so you can improve while also not killing yourself. Because once you start to fail, you give up. But if you lower the bar, then you might end up jumping just as high as you’d first planned, once the stress of failing is removed. 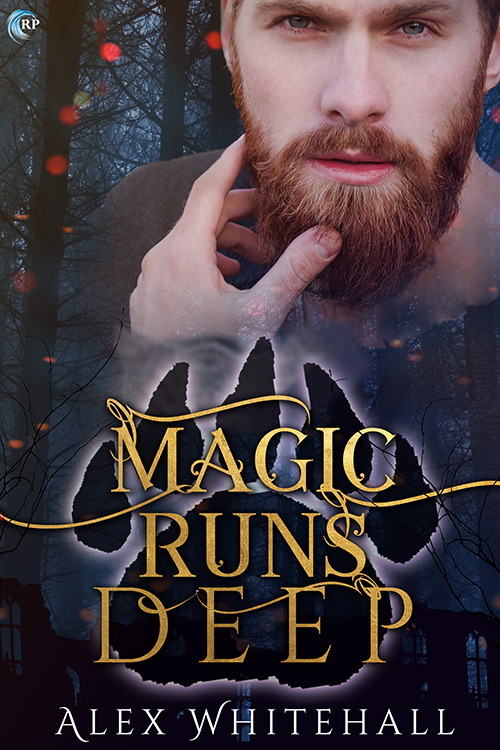 Magic Runs Deep is up on Riptide’s site, available for preorder!! It’s coming in April (SO FAR AWAY)! For the last five years, Veier has been chained to a king’s throne in his bear form. When a neighboring kingdom overthrows the crown, Veier’s imprisonment ends, but true freedom is not so easily earned. With blood on his hands, he needs someone with patience, strength, and trust to help him become the person he was before and prove to the invaders that he isn’t the monstrous king’s loyal pet. Elrid, the invading king’s brother and a powerful mage, is everything Veier despises. He’s also the only thing between Veier and execution, because he thinks he can help Veier change from an aggressive bear shifter into a reasonable man. While the pair have a rough start, with long talks and mutual leaps of faith, they begin to care for each other. However, the closer Veier gets to his freedom, the closer he is to losing Elrid. He must find balance in his heart and his life if he wishes to truly claim the freedom he’s been given—and the man he loves. I’m really grateful to the artist who made this lovely cover after I gave…less than stellar feedback on what I was looking for. January has also witnessed me get my first 10k written for 2018, which also matched up with me finishing my current WIP The Miracle Man. This book’s idea started several years ago, as a jotted opening in a notebook that sat unused in my bedside table for several years. Then during a writing slump, I said Well, why not write this, it’s utter bollox, and then everything started flowing. And now it’s done! Er, well, the firs step is. Anyway. I’ve also been reading! (You know…that 1 book a month goal.) I’m on-goal to finish What-the-Dickens by the end of January. It’s not captivating me, but it’s cute. I want to keep being better at my fitness ‘program’ and eating habits. I want to write 10K a month every month. I’d like to get three things published this year. I…didn’t do awesome. In fact, I forgot about the first goal completely (or at least I didn’t try harder than I normally do). I hit 10K roughly ever month. If I add up the months and average them out, it’s about 10,900 words a month. Three things published? Er. Well…I didn’t think this one through. I submitted three pieces to publishers, and two were accepted. One got feedback, one came out a few weeks ago, and one comes out in April. So I think that counts as a success, even if I didn’t publish three things this year. 2. Revise a book a month. Writing is only worthwhile if I actually revise and submit books for publishing. Last year I focused on publishing books, but I think it was too abstract (and much of it out of my control), so this time I want to focus on taking steps to submit books–aka, revise the stuff I write and move it along on the path of publishing! 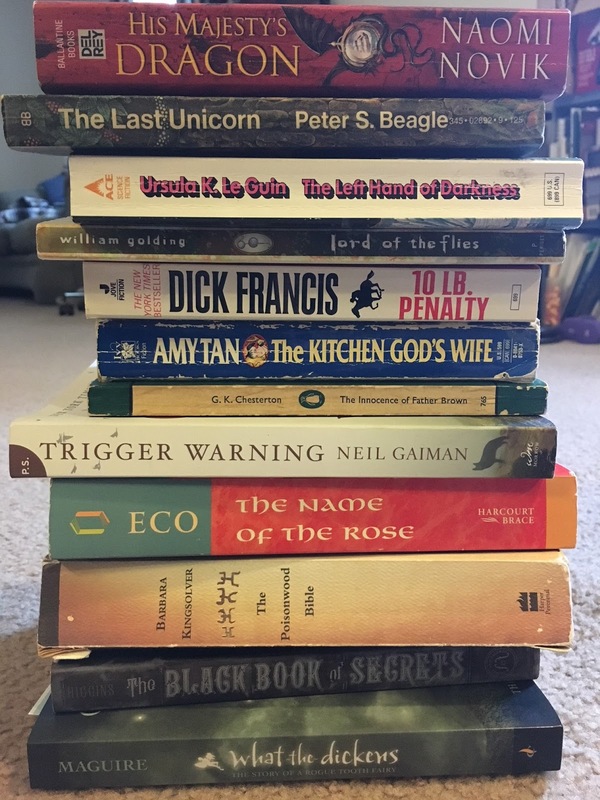 I figure some might get replaced by manga, some might get replaced by library books or new finds, but these are some titles on my shelves that seem like I should read or at least might be interesting. I tried for a variety so I wouldn’t get bored or burned out. First up will be What the Dickens. Good luck on your New Year’s Resolutions! I published two novellas: Second Skin and A Christmas for Oscar. I participated in Nano and hit the 50K goal! I wrote a 46K novel before Nano started (er, I sort of finished it on the first two days when I should have been Nanoing). I knitted a twin-size Spider-Man blanket. I made various doctor appointments, donated to a bunch of charities, got new glasses, and spent lots of time with friends (and family). I watched Yuri!! on Ice explode across my Twitter and Tumblr. I came out a little bit more to my family. I had my first In-N-Out. I rode, I laughed, I wrote, I lived. And for the new year? And I think that’s it for this year. 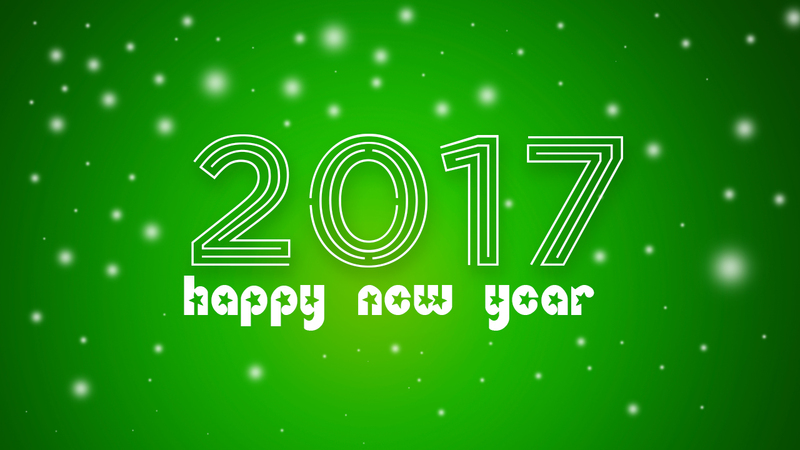 Let’s make 2017 as awesome as it can be. A casual google search will tell you that the “three weeks to start a new habit” is pretty much BS–it varies person to person and breaking a habit can take even longer, if not be a lifetime struggle. That said, if you’re trying to start a new habit, trying it out for three weeks isn’t really a bad way to go, if only to include it in your schedule and built it into the rhythm of your life. And maybe it won’t become a habit, but it certainly will be easier to do than before trying it! I started thinking about this as I’d fallen into the bad habit of not brushing my teeth as often as I should. I know it’s gross not to and I know brushing is good for my teeth, but when you work from home, laziness can happen. So this month I’ve set myself up to brush my teeth at least twice a day for the month. Every time I do, I put a sticker in my calendar. And if I get 30 stickers, I’m going to reward myself. Hopefully having done this for a month will mean that I’ll continue to do it for the months that follow. Next month, I’ll have a new goal and follow the same system. And maybe by January I’ll have fallen out of my first habit and need to redo it…and maybe I’ll push it for two months to make sure it sticks! It’s like doing new year’s resolutions, but only one and at the beginning of every month! We’ll see how it goes for the last three months of 2016, and that will decide if I continue doing this for 2017. Either way, I think trying to better myself in these little ways will definitely be a good change! We have reached the half-year point, and I feel obligated to take a look at how I’m doing on those new year’s resolutions. Take care of my teeth! I’ve been rather lackluster on this one. I think I did it for like a week. And then forgot about it. I should…start up again. Definite “necessary”….I made some good appointments, but haven’t made the ones I really needed to make. I was trying to do one “betterment” item a month. And I’ve skipped a lot of months. Work on generally treating my body well (exercise, eating, stretching, and RELAXING). I’ve done OK on this regard (woohoo!). I had some time in February and March that weren’t going well….and that probably leaked into April and I noticed it really affecting me. But May/June have gone pretty good. I haven’t lost weight or anything, but I’ve been more active and more focused on my food consumption. I still don’t always make the best choices, but I’m at least aware I’m making poor choices? I’ve been stretching, but only barely. And mostly in relation to riding horses. And I’ve never relaxed a single day in my life, I swear. But doing things that are less stressful but make me feel productive and that counts as relaxing to me! Hope you’re doing better in that regard than I am! A new year, and now some new goals! I did…okay here. I missed 3 months. And my goal was to not read any queer romances as part of this “book a month” but I definitely fudged on THAT end. But I also read a bunch of different books, which was good. So, mostly a win. And I want to keep this up! YES. I feel like I did well here. There may have been a month or two where I didn’t hit, but I made up for it with some of the other months. And that size is good for me right now. I want to keep it up, definitely. Sorta? All my friends use “they” pronouns and are cool with it and yay! But I’m still not really out with my family. Things didn’t really change as much as I had hoped in this regard. I didn’t necessarily feel like I was lying, but I wasn’t 100% honest either. But then, who does live their life 100% honest with everyone in their lives? And for this year? Well, I want to continue trying to read outside of work and hitting my 5K words a month. But those are continuing actions, not new goals. This year’s goals are going to be a been more physical in their aim. – Take care of my teeth! – Make necessary doctors’ appointments! And if anyone has tips on how to deal with the obstacle that is making doctors’ appointments, please let me know!